The New Slot Game Immortal Romance: The Saga Begins At Jackpot Factory. Online Casino News. 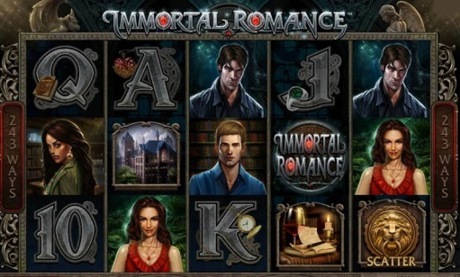 All Slots And All Jackpots Casinos Welcome A New Slot Game Immortal Romance With A Supernatural Romantic Plot. With the holiday season right around the corner, it's time for the biggest and best release of the year from top online gaming developer Microgaming. New game Immortal Romance is positioned to be one of the casino's flagship games, with its unique combination of dramatic storyline and thrilling slot features. All Slots and All Jackpots Online Casinos added this impressive new game to both the Viper and Flash casinos with double loyalty points for the days following the launch. Immortal Romance is a 5-reel slot machine with 243 ways to win and the opportunity to win up to 3,645,000 coins. Exciting features include the randomly-triggered Wild Desire bonus feature, which turns up to 5 reels wild and the Immortal Romance wild symbol which substitutes and doubles a win. By entering the Chamber of Spins, the lucky player begins to unlock a world of bonus opportunities. Each successful entry to the Chamber of Spins brings additional bonus features closer, for the opportunity to win even more generous cash payouts. A player's position is saved in the Chamber of Spins, allowing the player to take a break and return to the game without having to start over from the first bonus level. It's more than just a slot machine game. New at All Slots Casino, this supernatural tale brings to life a drama that will leave you at the edge of your seat, with dark secrets, mysterious characters and forbidden love. A dark tale of love and intrigue is just a spin away. Watch as the saga unfolds in this gripping slot filled with mysterious characters and forbidden love. The stories of Amber, Troy, Michael and Sarah come to life as you play with 243 ways to win, 4 free spin features, wild and scatter symbols, and more. The saga begins now at All Slots Casino!